This educational poster has been created and made available to you free of charge. 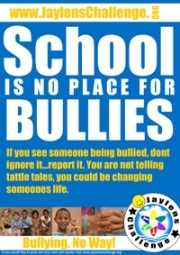 Designed to be printed off and placed in schools and/or any other organization where bullying may be a problem. We encourage all of our visitors to take the time to download our posters and help us raise awareness. Without the support of our supporters we do not have a campaign. There is no charge for these high quality super fabulous posters, but if you find these useful we urge you to please consider a donation. Downloading the posters is simple. Click on the link below and unzip then print them off on A4 paper.